1 of 3 Heat oil in large nonstick saucepan. Add onion and sliced mushrooms; cook over medium-high heat about 7 minutes or until softened. Add broth and 2 cups water and bring to a boil. 2 of 3 Cut sausage on the diagonal into 1/4-inch slices; cut carrots in half on the diagonal. Add to saucepan along with snow peas and red pepper flakes. Bring back to a boil. 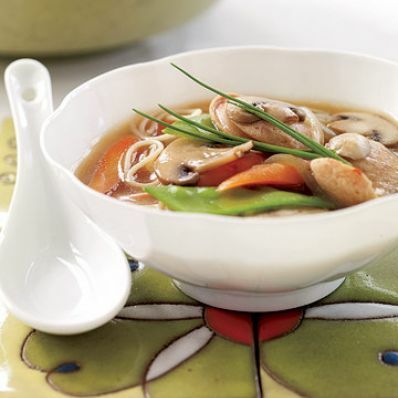 Reduce heat to medium-low and simmer for 5 minutes or until vegetables are tender. 3 of 3 Raise heat to medium; add teriyaki sauce and cornstarch mixture. Simmer 2 minutes, until thickened. Stir in angel hair; simmer 4 minutes or until pasta is cooked. Serve garnished with chives, if desired.